Please join me for a very special weekend of Yoga, Pilates and Somatic Movement at the Inner Guidance Retreat Centre in Lavenham, Suffolk lovingly run by dedicated owners Jo and Dom. Get Away From It All and enjoy many hours of practice in the peaceful yoga studio surrounded by beautiful Suffolk Countryside. This is a perfect place for a deep immersive experience. I will be carefully planning my First Retreat so that you refresh your knowledge of classical poses and become delighted with new moves and experiences on your mat while bringing as usual my passionate enthusiasm to the event! As well as interesting sessions throughout your weekend, you will enjoy three delicious gourmet vegan meals daily (free from preservatives, wheat, gluten, sugar and dairy) including a selection of fresh produce grown on the land and lovingly prepared by our hosts. A Special Somatic Movement Session designed to help you learn how to RELEASE body tension at the neuro-muscular level on Friday Evening. Whole Body Yoga Practices with an emphasis on Mindfulness and Key Alignment, created to enhance your existing yoga skills and RENEW awareness. Mat-Based Pilates to harness concentration and condition your centre. An opportunity to share with a like-minded intimate group or relax, read, sit by the fire. Plenty of practice as well as time to take a walk into Lavenham or around the grounds. Healthy freshly prepared organic vegan cuisine and juices to nourish your body and feed your soul. Also an opportunity to book treatments with the in-house Quantum Healing therapist. Hi, I am Rosalyn Griffith, YogaRos. I’ve been serious about Yoga since year 2000 when I fell in love with the mind, body and inner spirit wellbeing that regular practice brought to me. My teacher asked me to train and by 2006, I had completed a 3year Diploma with the British Wheel of Yoga. I then completed Pilates tutor training and have since become a Somatic Movement Coach. I have invested in high quality courses on Anatomy & Physiology (Level 3); Mindfulness; Restorative Yoga and recently became an accredited Hot Yoga Teacher. 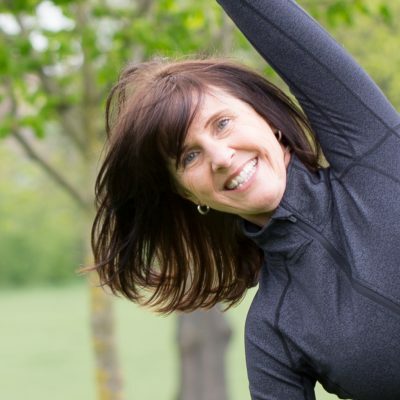 My specialist area of interest is back-care and especially with individual clients, I guide you to learn how to release tension from your body at the neuro-muscular level so you can experience movement freedom and improved awareness. I don’t enjoy labels and am not ‘guru-led’ but would describe myself as a Classical Hatha Yoga Tutor with a Creative & passionate approach. Sharing my 12+ years of teaching experience gives me the ability to assist individuals of all abilities, so that you can enjoy your postures with more ease, whether complete beginner or seasoned practitioner. You can expect to be coached in your practice with thorough alignment cues, mindfulness and attention to detail, while also honouring the traditions of yoga. On a personal level, I LOVE people, love laughter and love living my practice through joyful opening to new experiences…so Let’s Release, Renew and Refocus together.